All of Holland was on a severe storm alert so that was why our flight was cancelled yesterday. I decided I was staying home today and catching up on my journal. 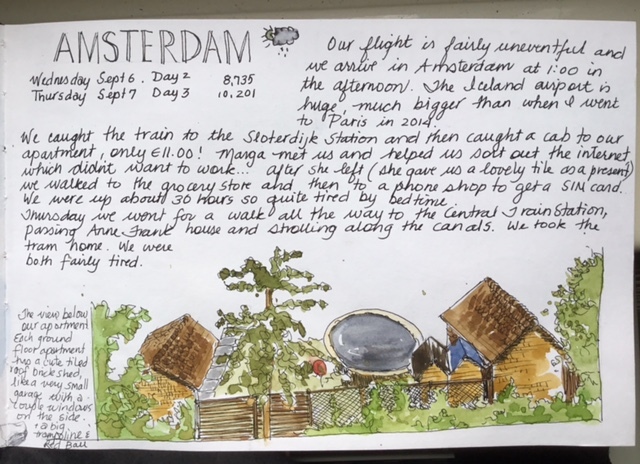 I love to journal when we travel but with blogging and journalling I sometimes get a bit behind. My blog has been giving me a bit of grief, some of the settings have changed, either I did it unknowingly or the site has been updated. Not sure which, but it is a nuisance, and it has been taking me much longer than it should to do each post. I think I have sorted it out, but then a new challenge arises. 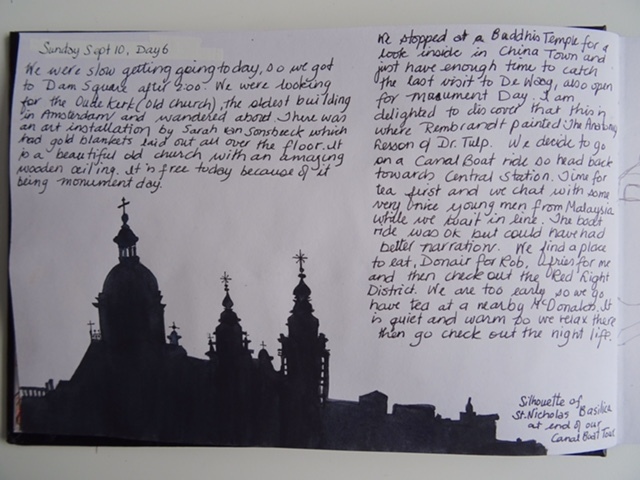 I need good light to photograph my journal pages so I can’t do it when we get home late. A scanner would be so much better but I can’t carry that around with me! When I can I draw on location but I also use my photos as reference when needed. The view looking down from our third floor window into our neighbour’s yards. 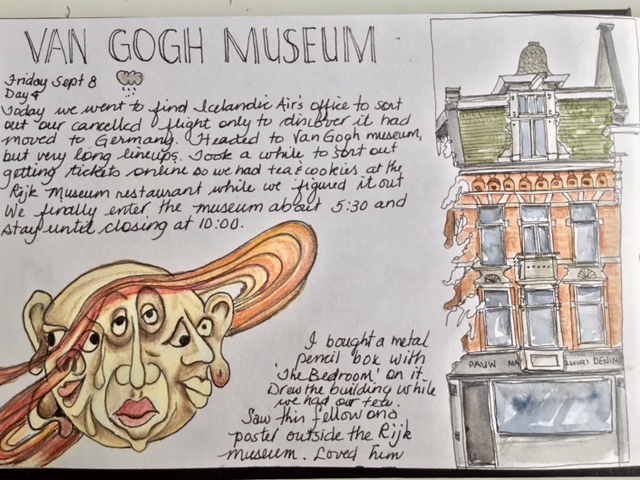 I worked on this page wile we waited in a cafe for our entrance time to the Van Gogh Museum. What can I say, I just loved these little statues! Somehow I got this page out of order, I labeled it Saturday and then wrote Sunday’s activities on it. White Out is handy in an art kit. I finally got up the nerve to start sketching on the tram. This always seems intimidating to do but once I start it really isn’t so bad. The young gentleman in the hoodie knew I was drawing him. When we got up to exit the tram I showed him the sketch and he smiled. Most people don’t really seem to mind all that much if they figure out what I am doing. I like to draw with a ballpoint pen, that way I am committed, and there is no erasing. 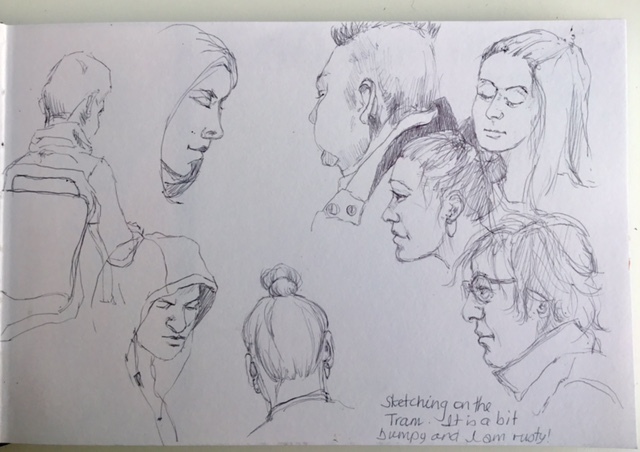 This entry was posted in Artists, Blogging, Churches, Drawing, Life drawing, Portraits, Uncategorized and tagged Art, art journal, Blogging, drawing, Drawing on the Metro, Life drawing, People Watching, sketches by Trudy. Bookmark the permalink. Thanks, It is fun to do too. Drawing with pen, eh? Courageous. Got a nice chuckle from the triple headed guy🤗Yes! 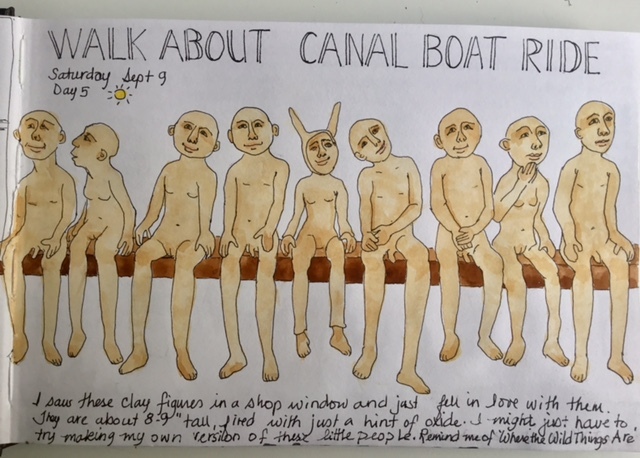 The canal people DO remind me of Where the Wild Things Are! It forces me to make all my marks be purposeful. I love your blog and journals.. would love to see them one day. For sure. When we are home we will have to get together for tea and a visit.